Somehow I've managed to accumulate a lot of cleansers. In order to be a bit efficient I've decided to make one post on the cleansers that I currently have on rotation. My one face cannot get through all these cleansers so I do have other family members who are also using these with me. First up we'll start with the two Garner Products. I did cheat a bit as these two are scrubs not regular cleansers but I still wanted to included these two. First up the Garnier Balancing Gel Exfoliator*. This is targeted towards combination skin types as it claims that it balances the skin. This has a fresh scent due to the Grapefruit and Pomegranate it contains. I found that the exfoliant particles are not very rough so I think this would be a good alternative for those who are just starting to exfoliate as it's not harsh. I'm used to harsher exfoliants so I don't normally reach for this one. Next up the Garnier Impurities Eliminating Scrub* - this scrub is targeted to those with oily skin. I also had the cleanser version of this scrub but have not been able to locate it. It was very similar to the scrub with the same scent but obviously more suited for day to day. I really liked the scent of this product. It's kinda fresh and kinda masculine which I love. But again as the other Garner scrub I found that it was a gentler scrub. Again, I think this would be suited for those who are just starting out to exfoliate. 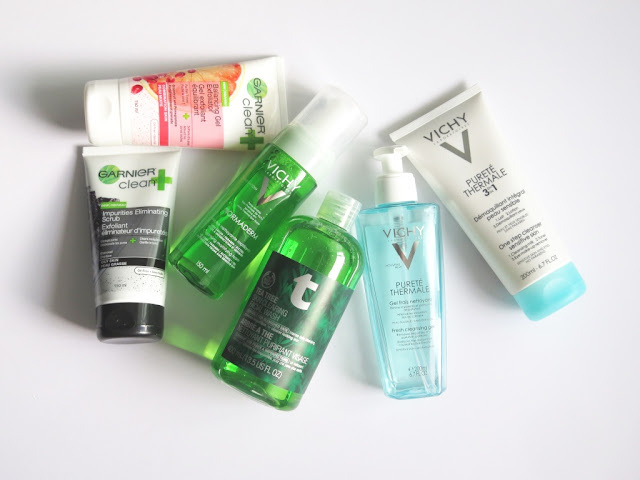 Next up two cleansers that would be a great choice for acne prone skin - the Vichy Cleansing Mattifying Foam Cleanser* and The Body Shop's Tea Tree Skin Clearing Facial Wash*. 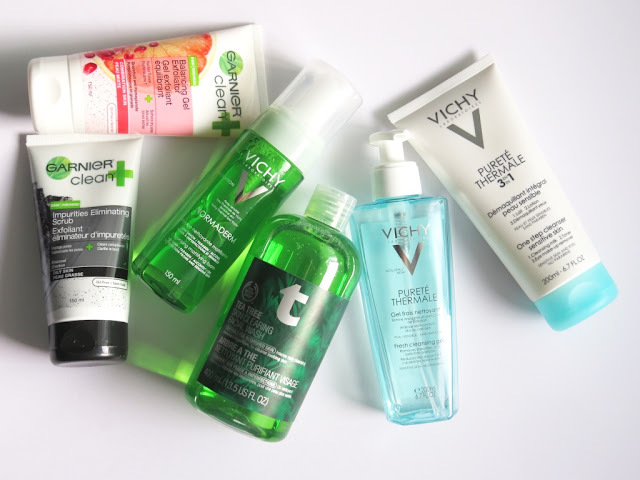 As the name suggest the Vichy cleanser comes out as a foam. I'm not partifucally used to using foam cleansers so this took some time to get used to. It's a nice cleanser that leaves my skin feeling clear and fresh. Since the Normaderm line is targeted to those with acne I think I'll be passing this along to a friend that would be better suited for it since I don't have acne prone skin. 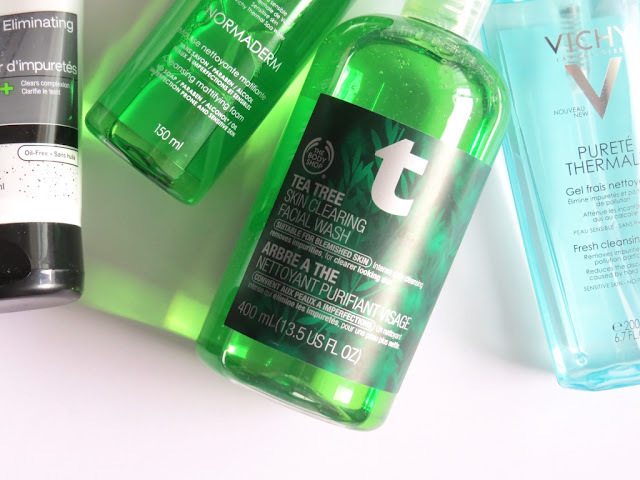 Another option for those with acne prone skin is the Body Shop's Tea Tree Skin Clearing Facial Wash*. Like the Tea Tree Oil - I'm not a fan of the scent but it's something that I've gotten used to. I don't use cleanser everyday, only if I'm breaking out or having a particularly bad skin day. Even with this cleanser having tea tree oil I've found it be gentle on the skin and hasn't broken me out after using it. 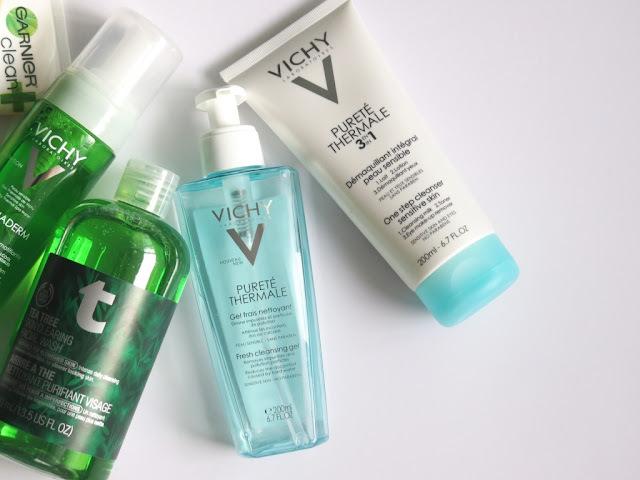 Next up two choices for those with sensitive skin - the Vichy Purete Thermale Fresh Cleansing Gel* and the Purete Thermale 3-in-1 One Step Cleanser*. I use the 3-in-1 One Step Cleanser to first remove my makeup. What I like about this cleanser is that it's gentle enough to use around the eye area. I find that it doesn't remove all mascaras - I've been using the Benefit's They're Real which is one of the hardest mascara's to remove at night. After the 3-in-1 One Step Cleanser I use the Fresh Cleaning Gel all over my area - avoiding the eye area as this is not to be used there. Personally my favourite type of cleansers are those with a gel consistency - not sure why I think it's the texture of it. I really like this cleanser as it leaves my skin feeling clean but not tight after use. I'm more that half way done already! Even though I don't have sensitive skin I still like to use these on a day to day basis. 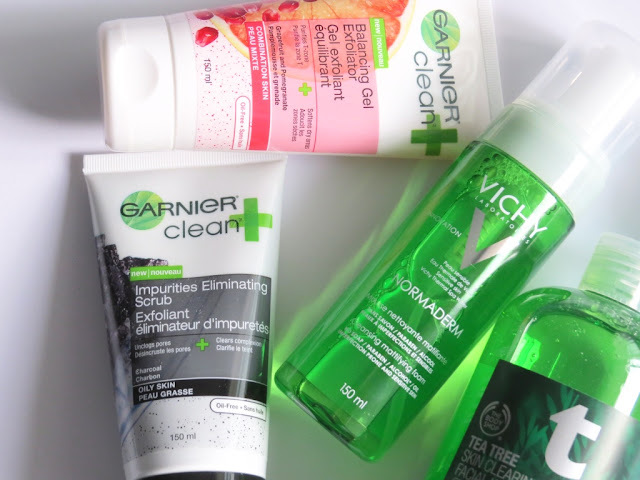 Well that completes this cleanser post! It was quite a long one but I hope you found it useful! 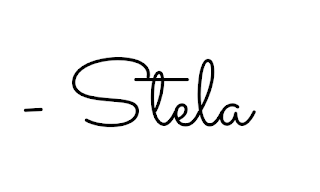 * This post contains product(s) provided for review purpose. All opinions are my own and no compensation has been provided for this post. Products provided for review purpose have been marked with a (*).